Set the heads and intake on with a couple of bolts, drop the distributor in and snug it down and then check things up front. The cam gear already has a roller thrust plate built into it, can I just add a regular thrust plate behind it? Comp Cams makes one that is .020 (cant find one thats only .010 thick) and by adding that, it would eliminate all rearward movement and keep constant contact on the block. I was thinking you were talking about .090" or so. .009" is not going to be an issue; the crankshaft thrust will be some part of that. Is the cam timing gear position pretty much located by the crank timing gear? The lower crank gear is a fixed position (press fit) and since the cam timing gear has nothing to hold it in place, doesnt the in/out positon of the cam sprocket get located by the position of the crank gear and the chain thats locating it? With that said, I just installed a new Solid Roller cam and timing chain (comp #7100) which has a built-in thrush bearing and with the crank gear fully seated, the cam is being pulled out slightly by the chain and my thrush bearing isnt making constant contact with the block.. Also when i put the timing cover on (with the gasket) I have no clearance between the cam button and timing cover because of this too. Is there any way to resolve this? Install with timing cover,button and timing cover gasket your going to use.Tighten cover down,this will pull cam back into position. Now make sure lifters are riding centered on cam lobes (should be close). If not center lifters by removing material from end of cam button or adding longer button (usually not needed with correct assembly). At this point you probably want have any endplay (check). What i usually do is add one or two extra timing cover gaskets to get some endplay,or you can grind material from cam button. A lot easier to add a gasket or two. I always pull intake and recheck where lifters are riding after some run time if possible. Usually things are OK. Thank you very much for explaining.. Do you still want end play on a roller button too? YES!! Same endplay as nylon cam button. Without endplay the steel roller button will come apart on you! I've used both. The nylon buttons are more forgiving. I only use steel roller button if timing chain cover has mutual (thrust washer) surface to match (stiff and round) small end of steel roller button. Many different timing covers out there. i always used this type of cover with a "Y" shaped steel reinforcement brazed into the "Y" groove on the cover. I always did the exact same thing!! Used to scrap pretty much everything on the motor sometimes but i would save those timing covers! YES!! Same endplay as nylon cam button. Without endplay the steel roller button will come apart on you! I've used both. The nylon buttons are more forgiving. 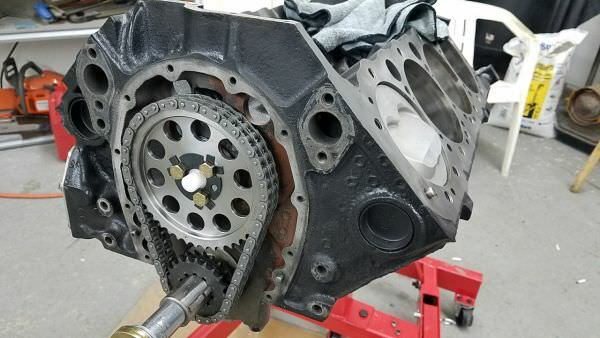 I hope the OP doesn't mind, but I'm trying to figure out the timing chain, cover, gasket, cam button, & timing tab for my GEN1 SBC with retro roller cam, too, and I had the same question. Why do you want the end play vs. no end play? Can you explain this a little bit more? Is that point that in general, you don't want the roller button to actually be contacting the cam at all, but when you end up in a condition that pulls the cam forward (rapid decel???!?) the roller button simply stops it from moving too far forward and is only spinning for a short period of time after which the cam snugs back up to the block surface / torrington bearing? The idea is to limit end play to a certain amount. I was just checking the specs on a cam using a stock silent chain that appears to be in good shape. The cam can be pulled out of the block nearly 1/4". On the stock stuff this timing set came from, it probably didn't matter. In a performance app, It's not what you want. I don't mind, all my questions have been answered..
You need a little clearance for the expansion of the parts as the engine heats up in operation. o As per earlier post, end play must be controlled to prevent the helical distributor drive gear's movement from altering spark timing. o Flat tappet cams are ground with a couple of thousandths taper across the face, which allows spring force to hold the cam rearward with the cam gear thrust face against the block. o Roller cams have no taper ad require some other locating mechanism. o End play can be measured several ways. I prefer using a test indicator https://www.google.ca/search?q=test+ind ... 45&bih=885 down through one of the drain holes above the cam and contacting the front or rear of a lobe. o Many two piece covers (e.g. Cloyes and clones of same) have a threaded externally accessed thrust bearing that allows easy adjustment. o Rather than me typing it all out here, Google "adjusting SBC cam end play" for 106,000 explanations.